Meanwhile the seed market is evolving even more rapidly. Seed investors raised $3B in 2013, up 6x from 2011. In addition, VCs are altering the dynamics of the seed market, increasing seed round sizes by 4x. As a consequence of all this turbulence, there’s a relatively new but important phenomenon I’ve noticed in the seed market: the Second Seed round. Some startups raise an initial seed round of somewhere between $100k-$1M, and six to nine months later, they raise an additional $1M or so. But how common is this second seed round? And how are the Series A fortunes of a startup with a second seed round impacted? Second Seed rounds have grown dramatically in frequency since 2009, as the chart at the top of the post shows, reaching about 100 in 2013. 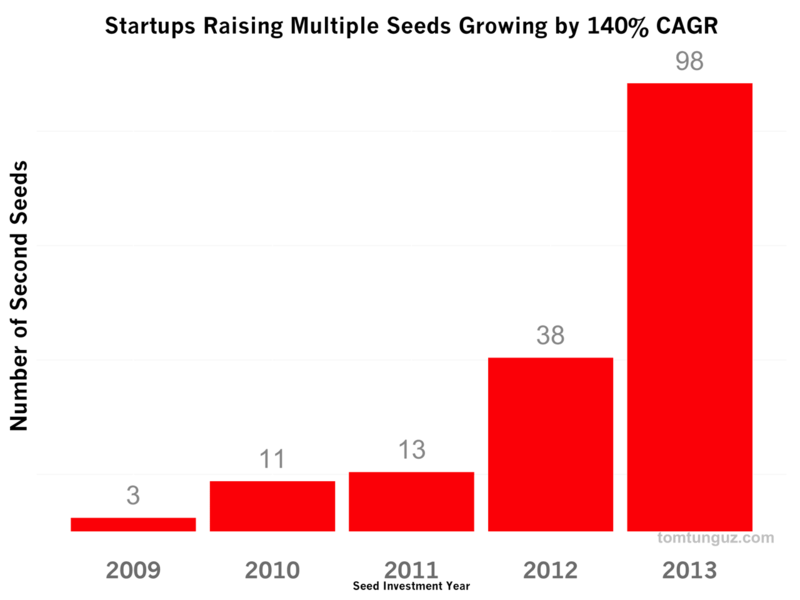 The number of these seeds recorded in Crunchbase data has grown by 140% annually, from only 3 in 2009. This analysis considers only initial seeds greater than $100k that are followed by another seed round for startups in the US. Though 98 seems like a small number, these seed financings represent 7.5% of the reported seed financings in 2013 (of those with disclosed financing amounts). 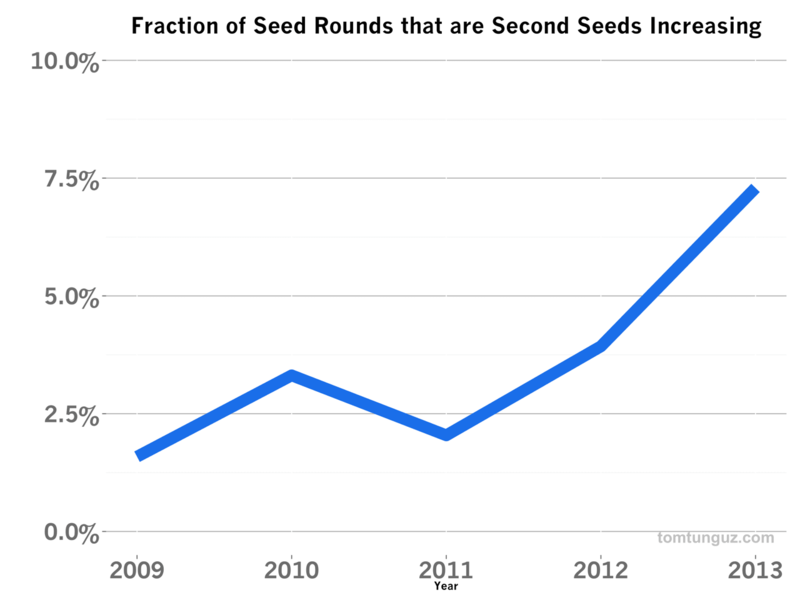 Second Seeds have increased in frequency from about 2% to 7.5% in 2013. These rounds are no longer rare. As Second Seeds increase in prevalence, we can begin to study the impact on a startup’s ability to raise follow on capital. One one hand, startups that raise Second Seeds haven’t built enough momentum to raise Series As (presuming that’s their goal). On the other hand, a Second Seed provides a startup more time to generate greater momentum and achieve milestones to catalyze a Series A financing. Let's compare the fundraising success of startups which raised one seed and those that raised two. 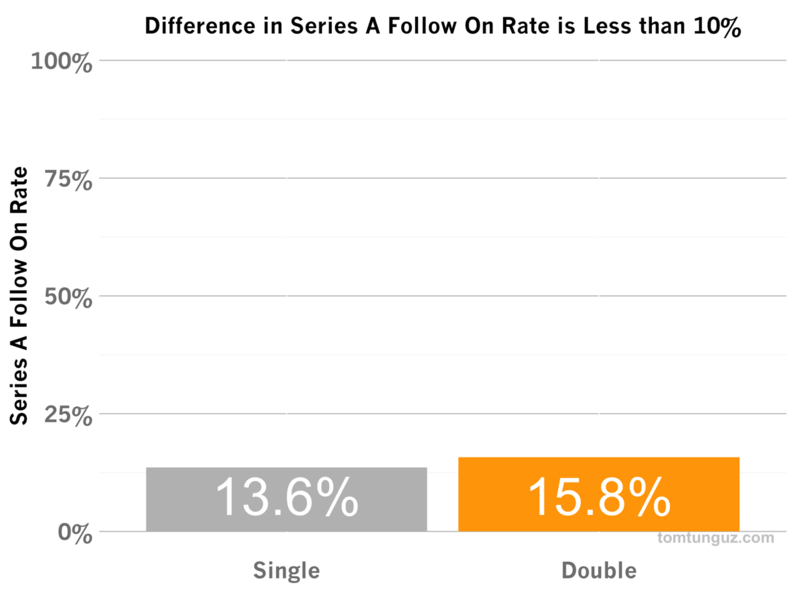 The bar chart above contrasts the Series A follow-rate of startups following different seed strategies. Although the Second Seed startups record a 15.8% success rate, a 10% increase compared to the 13.6% success rate of single seeded companies, the difference isn't statistically significant. The potential signaling risk of a second seed is immaterial. As for the typical Series A raised by the two different populations of startups, the conclusion is the same. Both single and double seeded startups raise statistically comparable Series As, somewhere between 4-5 million. Dilution may be the only meaningful difference between a startup which raises one seed and a startup that raises two seeds. But the difference in founder ownership is dependent on the terms of each of those two rounds. Unfortunately, we don’t have that data available to analyze. 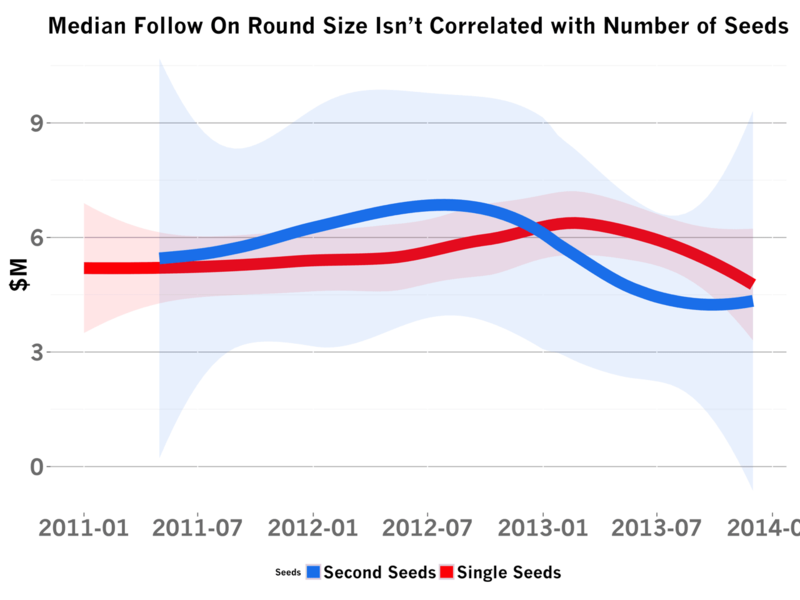 Second Seeds have become much more common in the past four years. And as long as the Series A market continues to boom, we will continue to see Second Seeds. For some founders, this new financial product, the Second Seed, may be just the right financial product to lock in a great Series A.